This is a compact simple and fast 13.56Mhz contactless RFID Reader with a USB interface. It reads the ID number from the 14443A card or a compatible card. After detecting the card, the card number is sent directly via the USB interface, just like the entry number from the USB keyboard. This 13.56Mhz Contactless USB RFID Reader is a standard HID devices, means you don't need to install any driver, the code can be read into any input editor. For example: Notepad, WORD and other text editing software. USB interface, no driver required. Reads the RFID card inside the ID number and send it to the computer via the USB interface. The output format can be selected by management cards. Interface: USB, 106bit / s, no additional driver required. Connect the card reader to the computer USB port with the given usb cable. The reader will 'Beep' sound and flash about that power successfully, and then half a second after the 'Beep' sound and flash about that device self-test successfully, without Install any drivers, windows will automatically recognize it. 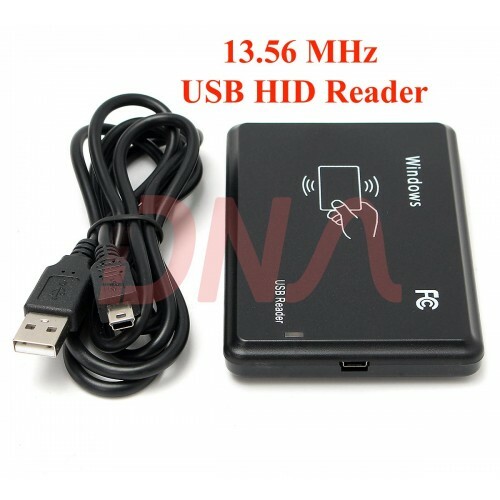 Please Note RFID tags are not provided with this reader you will have to buy them separately. 125 KHz RFID Reader JT308 125 Khz HID USB Proximity RFID Reader JT308 is a compact simple ..